deSIGNery Sign Company is a supplier of high quality custom screen-printed point-of-purchase custom floor stickers and graphics. If your concerns are durability, long lasting color, and exposure to foot traffic, then deSIGNery is your 1st choice for advertising on your floor. Graphics are a great way to draw the customers eye to your floor advertising. deSIGNery Sign Company is NOT Affiliated with FLOORgraphics, Inc.
custom floor graphics and stickers are excellent for attention-getting store graphics or safety messages. Overlaminated for safety and durability, they will withstand scuffing, washing, and waxing. A great Point-of-Purchase item! Check out our Spring Sale for savings on Custom Floor Stickers and Floor Graphics in the following link. 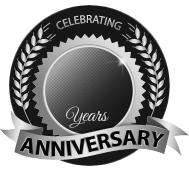 BBB Member since 2004 with a proven record of complaint free customer satisfaction on items like Custom Floor Stickers. Click on the BBB logo above to check our record or leave a customer review. If you are in the market for Floor Graphics, give us a call today and you will soon realize why after 24 years we still have an A+ BBB rating! At deSIGNerySigns.com we have more than 24 years experience in designs for our Floor Graphics. Call us today and let our design specialists help create your next project to promote your product or business. FREE Shipping on all decal and sticker products | Free layout | A+ BBB rating | 24 years in the business | Call Today for a free quote on Floor Graphics. Watch your step! deSIGNery’s floor stickers are sure to stop your customers dead in their tracks. With bright screen printed or 4 color process printed colors, our floor decals are sure to stand out and make your customer take a second glance. Floor decals are beneficial to many companies. Grocery stores, home improvement warehouses, doctor’s offices, retail stores, and vehicle dealerships are just a few companies that can use floor decals to their benefit. deSIGNery floor decals are also a big hit at trade shows. Our decals are made of high quality vinyl and have a slip-resistant over lamination for you and your customer’s safety. Our custom floor decals also have a special removable adhesive. The adhesive is strong enough to last for your promotion, and easily removes when done. Our Floor Graphics stickers are printed on a white vinyl with a special removable adhesive and overlaminated with a slip-resistant lamination. 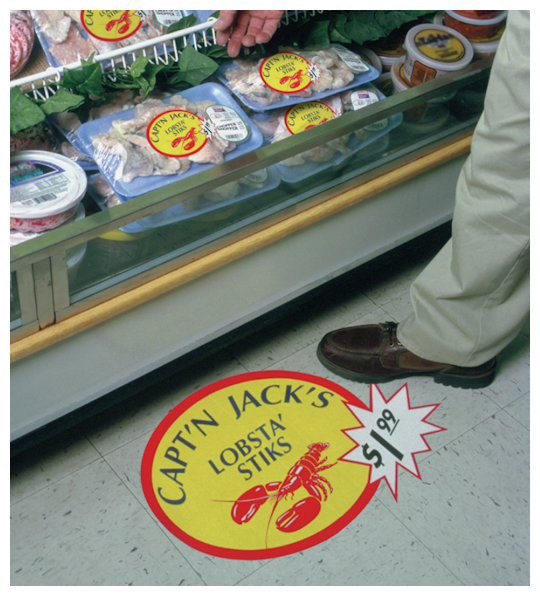 Custom floor stickers are great for directing foot traffic, promoting certain items for sale, promotion discounts, and drawing attention to just about anything your company wants to show off. They can also be used creatively by zoos and pet stores. deSIGNery floor stickers can be custom printed, but they can also be custom cut to specific shapes. A few bear paw prints, frog steps, lion and tiger paw prints or any other animal prints are sure to catch many customers and direct them into a special exhibit at that time. deSIGNery floor stickers are also printed with UV inks to prevent fading, so you can also use these great looking decals outdoors. Ready to test one out? Visit our CONTACT US page and request a FREE sample of our floor stickers and graphics. You can also request a FREE quote on your custom floor decals.